Is it possible to repair damaged tissue? Tissue responds to injury or other damage with a two-step process: 1) inflammation; and 2) regeneration to restore homeostasis. 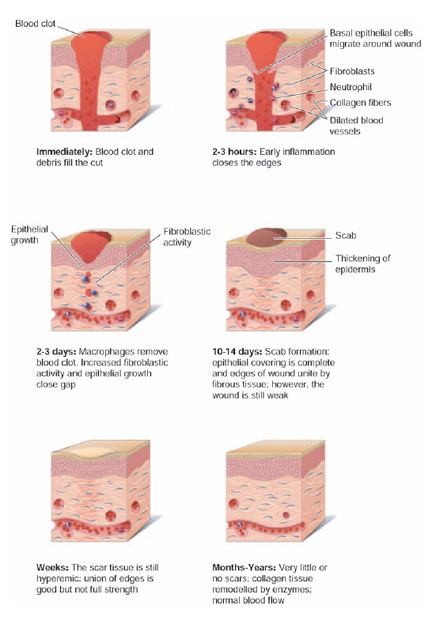 Inflammation, or the inflammatory response, produces swelling, redness, warmth, and pain in the area of injury. The injured area is isolated while damaged cells and dangerous microorganisms are destroyed. During the second process, regeneration, the damaged tissues are replaced or repaired to restore normal function. Regeneration begins while the cleanup processes of inflammation are still in process.